Dougie returns to work; Shelly lends her daughter some money; Mr. C makes a phone call. This episode is dedicated to the memory of Marv Rosand who played the cook at the RR Diner since the original series, revealed in this episode to be named Toad. Rosand died in 2015. At 1:49 on the Blu-ray, the Cosmopolitan and Vdara hotel-casinos are seen in Las Vegas. Seconds later, the Griffin, a real world bar is also seen. The song that plays over Lorraine's scene is "I Am" by BluntedBeatz. The entirety of the lyrics is repetitions of "I'ma, I'ma, I'ma good man." Lorraine appears to have a bruise on her jaw (left side). Has someone been beating her? Lorraine sends a text message to someone named (or codenamed) Argent, probably short-hand for Argentina since the message appears to go to the same electronic device Mr. C's later phone call goes to in Buenos Aires. In his cell, Mr. C looks in the mirror and sees his face begin to contort slightly into BOB's and he says, "You're still with me. That's good." This may suggest Mr. C was worried that BOB may have been forced to return to the Black Lodge during the incident at 2:53 p.m. the day before. At 6:54 on the Blu-ray, Mike Nelson has a Dell monitor on his desk. His computer appears to be running Microsoft Windows 7. Based on the Chevrolet sign seen outside the window seconds later, it appears Mike is employed at the Chevrolet dealer (presumably meant to be in or near Twin Peaks). Mike has a book called Mother Nature sitting on top of a stack of books on a chair in his office. Mike wears a wedding band on his left hand. Sheriff Frank Truman's wife, Doris, tells him, "Dwight's got diarrhea. The twins are coming this weekend. He got in the upper cupboard again. And I am not going another day with a leaking pipe." Who is Dwight? Is it the "he" she refers to who "got in the upper cupboard"? If so, Dwight may be a cat. Possibly, Dwight is named for President Dwight Eisenhower, since (according to The Secret History of Twin Peaks) Frank was named for the 32nd U.S. president, Franklin Roosevelt and Harry for his sucessor, President Harry S. Truman and the president who followed Truman was Dwight Eisenhower. Janey-E tells Dougie-Cooper that she counted the money he won in jackpots at the Silver Mustang casino and it comes up to $425,000. Dougie-Cooper sheds a tear while looking at Sonny Jim in the family SUV (a 1987 Jeep Grand Wagoneer). It may be that Cooper feels sad for the little boy who doesn't know he has lost his father, but is genetically, if not physically, the son of Cooper himself. At 12:20 on the Blu-ray, the house next to the tryst house at Rancho Rosa Estates is for sale by Zevranski Properties. Another house with a Zevranski sign is seen a few seconds later on the other side of the street. This appears to be a fictitious real estate firm. The car driven by the thieves who attempt to steal Dougie's car from in front of the tryst house is a 1972 Dodge Charger with Nevada license plate 974 6UH. When they do their first drive-by, they are listening to the song "Habit" by Uniform. Later, when they make the actual theft attempt, the song playing is "Tabloid" by the same band. 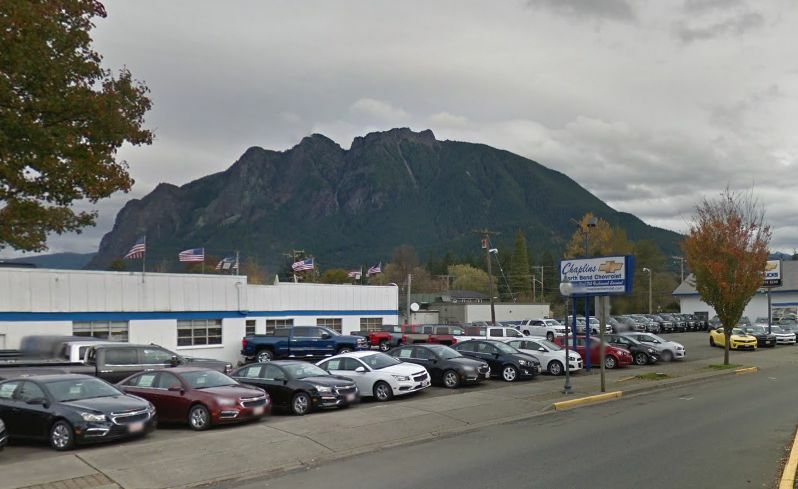 After she pulls up to the location of Dougie's place of work (Lucky 7 Insurance), Janey-E remarks that he may be having one of his "episodes". This may be a joking reference to episodes of this TV series, in addition to the implied mental aspects of his current behavior. Lucky 7 Insurance appears to be a fictitious company. The exteriors were shot at the New York Life Insurance Company, 801 N. Brand Blvd #1400, Glendale, CA. Red balloons are seen attached to a sculpture in the courtyard of the insurance building. Does the statue Dougie-Cooper is fascinated with represent an actual person? The statue was brought in by the production and does not exist at the actual location. 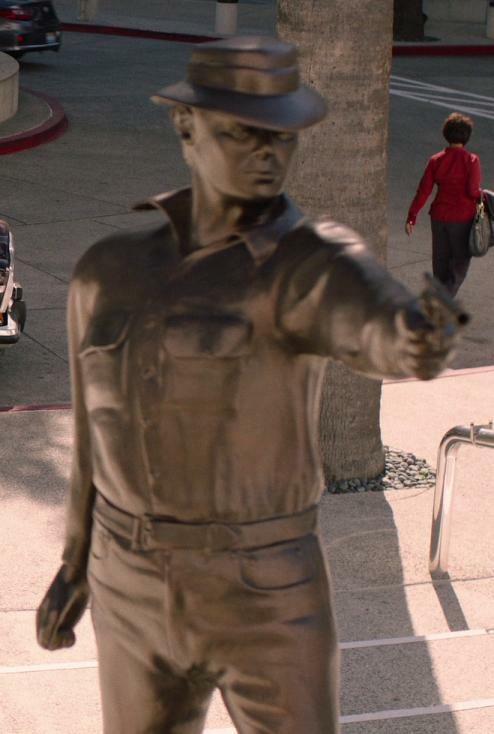 Cooper holds his left hand out as a gun, mimicking the statue, probably remembering his law enforcement days as an FBI agent. At 16:53 on the Blu-ray, Phil seems to be tapping his fingers against the coffee cups to the drum beat of the background soundtrack music. When Phil sees how much Dougie-Cooper is enjoying the coffee, he says, "Damn good joe, huh, Dougie?" This is a callback to Cooper's own line about "Damn good coffee" in Episode 2:_"Zen, or the Skill to Catch a Killer". When Tony Sinclair sees that Dougie is finally back at work, he says, "Hey! Look who's back from Bendersville." He is likely not referring to an actual place, but to the act of having a bender, "bender" being a slang term for a drinking spree. 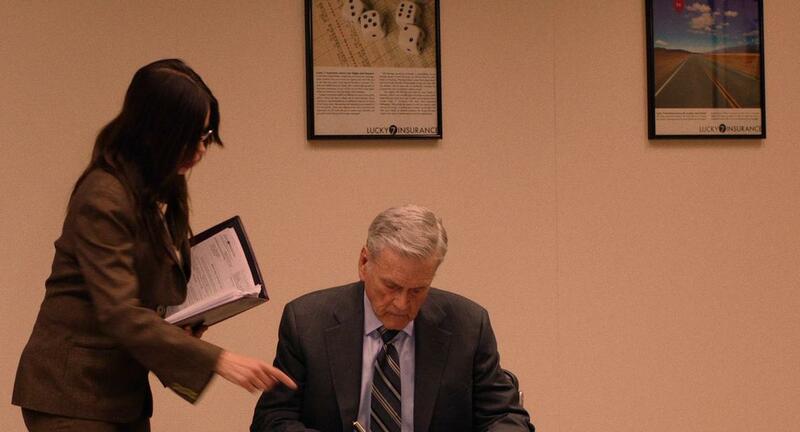 Notice the promotional images hanging in the conference room of Lucky 7 Insurance at 20:50 on the Blu-ray. One has two sets of dice depicted, yet neither set shows a number totaling 7...they both total 8! Seems odd for a company called Lucky 7! The other promotional image depicts a desert road with a red balloon floating above the road. Another promotional image seen in the conference room shows the Las Vegas sign, with what may be red balloons floating nearby, but we only get a distant look at it. The red balloons seen throughout the season are probably meant to make one think of the internationally-known 1956 French short film The Red Balloon, about a boy who finds a red, helium-filled balloon that seems to be sentient, silently following the boy for days through his life, playing with him, and leading him into various adventures throughout the neighborhood; possibly we are meant to relate this to Dougie-Cooper, a silent, empathetic figure who seems to have a magic touch (or magic presence) as he floats through the life of Dougie Jones for about a week. At 22:06 on the Blu-ray, a green light flashes on Tony's face for a couple seconds as he states that the Littlefield claim was not arson, so the company has to honor it and pay out. The light apparently leads Dougie-Cooper to proclaim him to be lying. The large framed poster in Mullins' office informs us that he used to be a prizefighter in his youth. 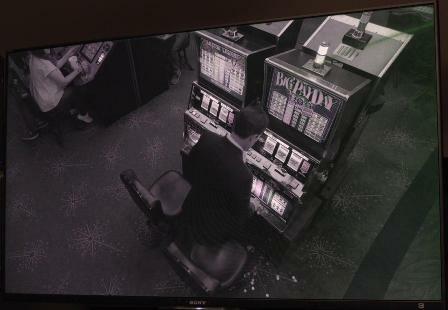 At 25:52 on the Blu-ray, a video surveillance playback of Dougie-Cooper's jackpot win at a slot machine shows a green line coming from the upper-right corner to the top of the slot machine. What is it? Is it the power of the White Lodge (or whatever) affecting the probabilities of winning on the machine? I don't know how things work behind the scenes at a casino, but a simpler explanation might be that the line was placed there by an analyst examining the footage in order to point out the machine that is meant to be the focus of review. The Silver Mustang surveillance monitors are Sony models. At 28:04 on the Blu-ray, Warrick's name badge shows his first initial as R.
A red balloon is seen in the house of the drug-addled mother and her little boy. At the car wash at 30:53 on the Blu-ray, it is seen to use Peco car washing equipment. R-Tech brand insulation panels are seen high up on one wall. The car seen being run through the wash is a 2014 Jeep Cherokee Trailhawk. Jade's Jeep is seen to have Bridgestone Dueler tires. The detailer at the car wash finds Cooper's old Great Northern Hotel key under the passenger seat of Jade's vehicle. The back of the key tag features the slogan "Clean place, reasonably priced." But this is the phrase Cooper himself used when asking Sheriff Harry Truman if he could recommend a place to stay in Twin Peaks at the start of the Laura Palmer murder investigation way back in 1989 (in Episode 0A: "Wrapped in Plastic"). So why is it on the key tag? Also notice that the sticker on the key says to mail it to the Great Northern, Twin Peaks, WA, but no other address! I'm not sure the post office would actually deliver it that way. These may be hints (particlularly the Cooper quote) that this world is a dream...Cooper's dream! Dream evidence (whether it's entirely Cooper's or a shared dream) accumulates throughout the season. A Seattle Times newspaper machine is seen outside the RR Diner. At 31:53 on the Blu-ray, the newspaper article framed on the wall in the booth at which Norma sits has the title "Double R Diner Wins Award for Best Local Takeout Meal". It appears that this booth has more-or-less been turned into Norma's permanent work desk, as it has a desk phone on it, a small lamp, and a pen holder. At 32:03 on the Blu-ray, it looks as if the RR Diner still has the same jukebox it had in the original series. It's looking quite beat up now though. The screenshot below is a closer view of it from Part 11: "There's Fire Where You Are Going". Norma refers to the cook at the diner as Toad. He seems to have no connection to the customer also called Toad who appeared in several cameos in the original series. The same actor (Marv Rosand, who died during shooting in 2015) was presumably the same cook in the original series as well, but never referred to by name. When she brings fresh bread for the RR's kitchen, Becky's apron tells us that she works for Sweet Loaf bakery. This is a fictitious business. At 33:33 on the Blu-ray, Steven Burnett is seen to drive a 1979 Pontiac Firebird Trans Am with WA license plate ER3Z7LL. At 34:27 on the Blu-ray, a store called Birches is seen in the background. This is an actual business (a gift and women's clothing shop) in North Bend, WA, diagonally across the street from Twede's Cafe (RR Diner). Steven gives Becky a powder to snort that may have been the drug called sparkle mentioned in Part 1: "My Log Has a Message for You". At 36:57 on the Blu-ray, we see that Steven has an Alpine car stereo. The song that plays on it is "I Love How You Love Me" (2017) by the Paris Sisters. At 38:37 on the Blu-ray, the last man out of the elevator in Dougie's building at end of the day appears to be making the American sign language sign for "thank you". A Hilton hotel is seen next to Dougie's building at 38:39 on the Blu-ray. At 40:53 on the Blu-ray, Jacoby is wearing a cap with an older, more European version of the shell and flame Army Ordinance pin worn by Cooper in Episode 2:_"Zen, or the Skill to Catch a Killer". An image of the Statue of Liberty is seen behind him. At the beginning of his Dr. Amp broadcast, Jacoby refers to the mountain range on which his studio on Whitetail Peak is in, as the American Hindu Kush. The Hindu Kush is a mountain range that runs from central Afghanistan to northern Pakistan. I'm not sure why he identifies his Twin Peaks mountain range with the Hindu Kush unless it's that the range extends from the United States into Canada. He may also be referencing the strain of Cannabis called Hindu Kush, since The Final Dossier reveals he has a fondness for weed shared with Jerry Horne. Jacoby recites "in the immortal words of Pete Seeger", "If I had a hammer..." Pete Seeger (1919-2014) was an American folk singer/songwriter known for the 1949 song "If I Had a Hammer". Lt. Knox informs Colonel Davis that they've received another hit for the fingerprints of Major Briggs...the 16th time since he died 25 years ago! The song the band plays at the Roadhouse as Richard Horne smokes his cigarette is "Snake Eyes", performed by Trouble. The band includes Dean Hurley (sound editor of the new series) and Riley Lynch, son of David Lynch, along with Alex Zhang Hungtai. Richard hands Broxford a Morley cigarette pack. This is a fictitious cigarette brand, widely used in TV and film, most commonly recognized as the brand favored by the Smoking Man in the X-Files TV series. The packaging is made to resemble the real world Marlboro brand. At the Roadhouse, Charlotte holds a cigarette and asks Richard, "Can I have a light?" Is there a connection to the supernatural woodsman with an unlit cigarette in his mouth who asks multiple people, "Gotta light?" in Part 8: "Gotta Light?" There doesn't seem to be much of a connection other than the revelation in Part 16: "No Knock, No Doorbell" that Richard is the son of Mr. C, thus both individuals are connected to the Black Lodge. At 52:01 on the Blu-ray, Agent Preston appears to be looking at the reversed fingerprint file of Mr. C which she will later mention in Part 7: "There's a Body All Right". The security monitors at Yankton Prison are Dell. The numbers input by the doppelganger during is phone call are, using the standard DTMF tones pitched up 2 octaves for offscreen ones: 16 (pause), 1235789 (computer modem response), 3135378912315 (01189998819991197253 offscreen). This could be interpreted as two numbers dialing to get an outside line from the internal prison phone system, then a 7 digit local number calling a computer set up beforehand with a local number so it would be a free local call and finally a code that triggers a pre-planned, automated hack of the prison systems. Is there any significance that the number 4 never appears in all those strings of numbers? And the number 6 only appears once. These omissions occur even in the second set of numbers, which is simply 1-9, minus 4 and 6. Time is often called the fourth dimension of the universe in which we dwell. 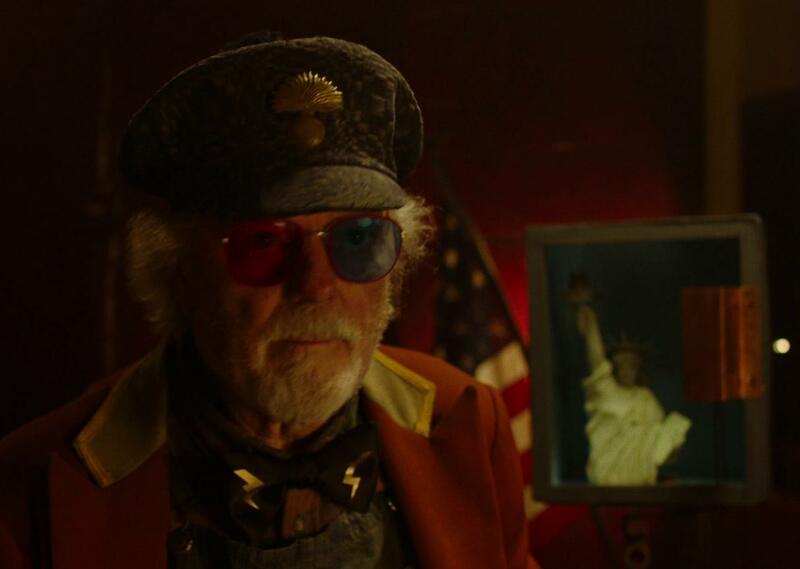 Maybe the omission of 4 by Mr. C has something to do with the time travel aspect that has been seen in Twin Peaks in connection to the Black/White lodges from time-to-time. At the end of his phone call, Mr. C says, "The cow jumped over the moon." The line is from the English nursery rhyme "Hey Diddle Diddle". In the shot of Buenos Aires at 55:25 on the Blu-ray, the Obelisco is seen, an Argentine national monument commemorating the founding of the city in 1586. To the right, an electronic billboard advertising Coca-Cola is seen, as well as a sign for LG. Another electronic billboard advertising McDonald's is seen just a bit farther up the street. Mr. C's message seems to go to the same device Lorraine called early in the episode. The device then suddenly shrinks down into what appears to be a small stone or lump of metal (possibly the box has just imploded into a compact metal lump).